We love a naked wedding cake here at Sticky Fingers Cake Co HQ! Wishing Lisa and Danny massive congratulations on their wedding day. 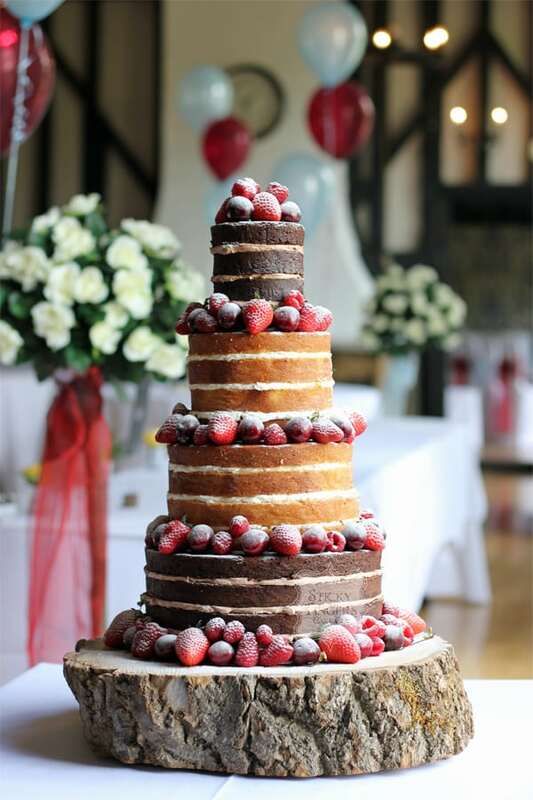 They were married at Maylands Golf and Country Club near Romford and chose to have a yummy four tier naked wedding cake with red summer berries as decoration with the obligatory dusting of icing sugar. I displayed their wedding cake on one of our log slice cake stands which always shows naked cakes off beautifully. Gorgeous flavours of Rich, Dark Chocolate on the bottom and top tiers plus Victoria Sponge and Zesty Orange as the other two tiers – a great selection for their guests! Hope you had the best day and I wish you every happiness for the future.